Ipoh is famous for its pork satay, but to me, Kedai Satay Xiang Ji in Malacca serves the best pork satay. rif told me he used to come here every Chinese New Year (apparently, it is open) to eat pork satay with his dad. It used to be only RM0.30 per stick, but now, it costs RM0.55 per stick. Don’t you just hate inflation? That aside, the satay was delicious. With just the right balance of meat and fat, the combination of well-marinated pork chunks and pork fat melts in your mouth. rif loves eating the usus (intestines) satay, and he always eats them whenever he’s at Xiang Ji. Sadly, they ran out of usus satay, so the poor boy had to stick to pork satay. The peanut sauce is different from the usual peanut sauce. 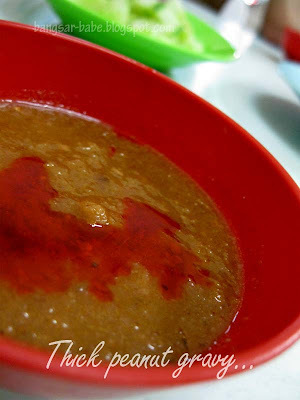 Chopped pineapples are added in the cooking process, resulting in a tangier, sweeter gravy. I usually don’t bother dipping the pork satay into the gravy as it is flavourful enough on its own. But I like eating the nasi impit, cucumber and onion slices with the gravy. The four of us polished off 70 sticks of pork satay in just 30 minutes. To be fair, the satay sticks were quite small. I finished one in two mouthfuls. rif has a bigger mouth, so he can fit a whole satay in. *LOL* If you happen to be in Malacca, go try this for yourself! 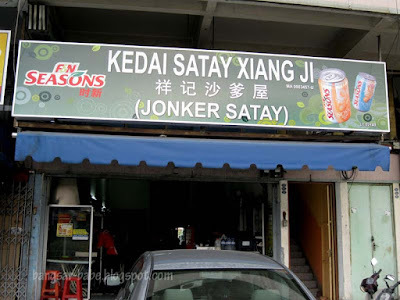 Xiang Ji is located off Jonker Street. It is just a short walk from Jonker Street, and it is opposite SRJK Pay Teck. Verdict: Succulent, flavourful and tender to the bite. Go try! My malacca trip is darn overdue!! 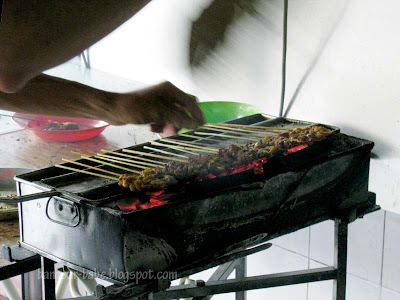 Any good pork satay in KL? pork satay! 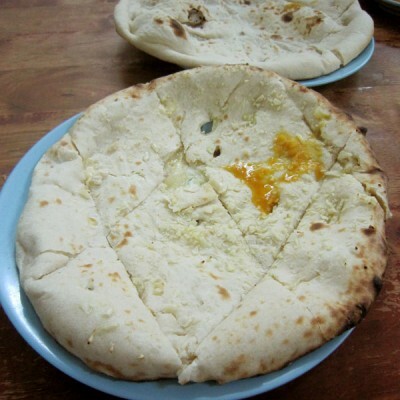 is there any in KL??? I don't quite like this one. I feel the owner tends to be 'bit stuck up and to be honest, the one in kota laksamana is much better. Just my opinion though. ai wei & Heng WG – Sadly…none that I know of. nomad – Drag unka there! If you are driving, take the high way (flyover) behind Makota Parade & in fromt of Holiday Inn and drive up the fly over and straight on. Further down on your right you will see a few 3/4 storey white building (make a U-turn) and enter to all the many Jalan kota laksamana(s) lane. 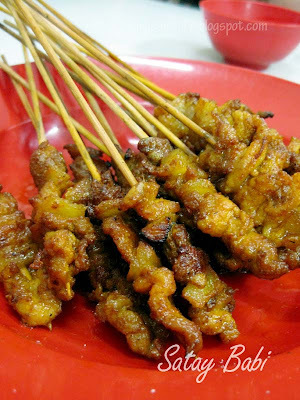 This satay is at 50/50A Jalan Kota Laksamana 1/1. While you are there, do not miss the famous Bei Zhan Restaurant that serve the wonderful Chinese cruisne. Must try the Kong Bak pau. (die die must try!!!) This restaurant food is so so good that my every trips to Melaka must have! open for lunch and dinner. Enjoy!